The biggest enemy (or ally) of Enterprise Transformation, is Culture. Do not underestimate the power of culture. Let me just say that one more time. Do not under-estimate the power of culture. Culture Trumps Everything™ is much more than just a saying. It is a very cold hard fact, which if literally has the power to move mountains, or destroy Enterprises. Bad culture trumps everything. Physics. Truth. Best Practice. Good Intentions. Good Ideas. Passion. Creativity. Teamwork. Trust. Common Sense. etc. It will take you good ideas, chew them up, spit them out, and then vilify you for having them in the first place. It takes passionate people and grinds them down until they can’t remember why they were passionate about something in the first place. It destroys people’s self-esteem. and like a cancer, eats away at the very core of an Enterprise. You can change as many fantastic Methods as you like, define as many perfect Artefacts as you like and change the Environment to use the most advanced tools, but like a cork bobbing in the sea, they are utterly insignificant compared to the churning seas of bad Culture. Even when the sea appears calm there can be dangerous undercurrents and hidden dangers that can sink the unsinkable (as I have found from personal experience over 40 years of professional life). All Enterprises have to navigate the icebergs of culture, but many of them do not realise that they can only see 10% of the iceberg, or is it perhaps, that many of them do not want to see the iceberg, preferring to deal with the obvious 10% and ignore the hidden and cynical 90%. Perhaps we should also introduce the term politics. Politics on the face of it should be a force for good – our countries are run by politicians after all - however, within an Enterprise, politics normally equates to a force for bad. Bad decisions are made because of politics. The more politics exists, the more bad decisions are made. On the other hand, good culture also trumps everything. Incoherence. Lies. Worst Practice. Bad Intentions. Bad Ideas. Apathy. Stagnation. Loose Cannons. Distrust. Stupidity. etc. It enables and empowers people to achieve and be the best they can be. It can allow people, and therefore the Enterprise, to grow and blossom and to improve the products and services they provide and the lives of their Customers beyond recognition. You can have as many bad Methods as you like, use as many awful Artefacts as you like and use the most basic of tools, but like a cork bobbing in the sea, they are utterly insignificant compared to the churning seas of good Culture. 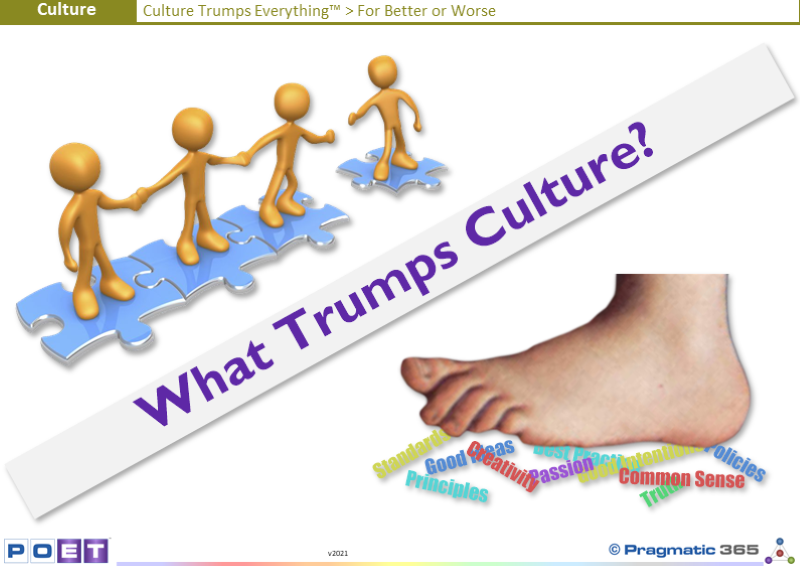 Does Culture trump things in your Enterprise? Is it a power for good or ill? What would you change about your Enterprises Culture? Who is Accountable for the Culture in your Enterprise?